For this manicotti kids cooking party we've done the planning now you can do the fun part. Cooking Manicotti is as simple as preparing lasagna. 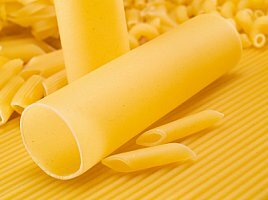 Manicotti noodles are round tubes and they look like a telescope so kids love to play with them. For this manicotti kids cooking party, you will want to write down the manicotti recipe below. Create one for each child that will be at the party. This will give them each a chance to follow the recipe while they are preparing the menu. It is also a good idea to include an extra one for them to take home, one that won't get cheese or spaghetti sauce on it. They can impress their own family with what they learned at the cooking party. Once you know the number of children coming go through the list of things needed especially utensils, bowls, etc. If you need extra ask friends or family if you can borrow some items for a manicotti kids cooking party. Ziploc bags -to fill the manicotti noodles (if you are using this method see below) if you are using spoons or hands don't worry about the bags. The first part will be a team effort. Have each child add one ingredient as follows. In a large bowl mix mozzarella cheese, cottage cheese, Parmesan cheese, egg and parsley together. If you have a large group (more than 4-5 kids) you will need to double the recipe and then you can split the party into two teams and each make their own bowl of filling. Have one child add the spaghetti sauce and hamburger together. Another child can stir. Give each kid chef a small rectangle disposable aluminum pan. Each child can spoon a small amount of sauce to cover the bottom of their pan. To fill the noodles use a spoon, fingers (make sure they wash their hands!) or have kids cut with kitchen scissors a corner of a ziploc bag to resemble a pastry bag. Stuff cheese mixture into noodles. Each child can have 3-4 noodles to fill their pan. Place noodles on top of the sauce and pour more sauce to cover the top of the noodles. They can sprinkle with more cheese on the top if they would like or leave it as is. Have each child put their name on their pan with masking tape. Have the adult cook at 350 degrees for 30 minutes covered with foil. Remove foil and bake 10 minutes or until noodles are tender. Stick a knife in a noodle and if it is tender it is ready. While the manicotti is cooking, prepare a dessert or other recipe you have planned, decorate aprons, chef hats or play cooking games.